Big John is our 1955 Seagrave Fire Pumper. He was given this affectionate name after Firefighters quickly recognized how big and beefy he was. Aurora Volunteer Fire Department transitioned to a fully paid, full-service department in 1957. Big John was the last apparatus purchased by the city while we were still a volunteer dept. Big John began his career at Station 5, which also served as our first fire academy training center. He ran calls in the busiest parts of town for roughly 20 years before becoming one of our reserve apparatus. After that, Big John would only be used when the newer, 1st-line apparatus needed maintenance. Big John ran as a reserve until the early 1980's, when the City of Aurora sold him to the Firefighters Union, Local 1290. 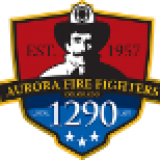 Aurora Firefighters Local 1290 have been his stewards ever since and have provided him every year for no charge to multiple functions in Aurora and around town. Big John has been Aurora Firefighter's centerpiece at the St. Patrick's Day Parade for years in Denver, escorted Santa Klaus on countless occasions, provided untold smiles for passenger children and adults of all ages and presides at Firefighter Line of Duty Death (LODD) and FF Retiree Funerals. Going forward, we will continue to do all of this, but in a more suitable fashion for passengers. Wagner Equipment Co. in Aurora is performing some engine work to alleviate Big John's overheating issues as well as addressing other issues including some oil leakage he's had...getting old is tough for anyone let alone a big guy like that! If there's anyone that can handle a big piece of equipment, it's Wagner! Big John is like a Tonka toy compared to what they usually deal with. When the machine shop is done with him, we'll move him over to Wagner's body shop. The amazing staff there will power wash the under carriage, expose and eliminate all the rust from the body, strip the paint, repair metalwork and repaint to the original cherry red he once was! Later, we will be adding padded seating and back rests to Big John's old hose bed so our passengers can ride more safely and comfortably. We will also add a casket configuration, to transport remains for LODD and FF Retiree Funerals. Whatcha got under the hood? We're glad you asked. Big John sports a 900 cubic inch, twin plug V12 with a 6 speed manual transmission. This is Big John's original engine and it's quite a sight! Pierce Arrow created the original design in the 1930's when it was used for limousines and other luxury passenger cars. Pierce Arrow later sold the design to Seagrave who beefed it up to handle the additional loads of personnel, equipment and water. Similar designs have been used in aircraft engines such as the P-51 Mustang and other WWII aircraft engines. With the help of many community partners including Dry Dock Brewing Co., Fox News 31 Denver/KWGN Ch. 2 and many others, we've raised enough money to give this project a great start! More money will be needed to see this through like Big John deserves. Any monetary assistance you can provide will be key to closing this deal the right way!